What is the Integrated Urgent Care Service? Severnside Integrated Urgent Care (IUC) is a new urgent care service which replaces the current GP Out of Hours service from 2nd April 2019. The new service will incorporate the current NHS111 service for Bristol, North Somerset and South Gloucestershire and also include new elements such as a 24/7 Clinical Assessment Service. The Service is provided by SevernSide, a partnership between BrisDoc Healthcare Services (the current GP Out of Hours provider with over 17 year of experience) and CareUK (the current provider of NHS111 in this area). As the name suggests, this is an URGENT care service. That places us between daytime GP surgeries who deal with routine and long-term health issues and Emergency Services such as A&E and 999 dealing with emergency and life-threatening conditions. Who is the service for and when is it appropriate to call NHS111? Integrated Urgent Care is an NHS service, designed to navigate patients to the most appropriate service for their medical needs. NHS111 is suitable for patients who are unsure where to go for medical advice or for patients with urgent health conditions that can’t wait until their daytime GP surgery is open and available to help. This is not an emergency service – For a medical emergency or life-threatening condition you should always dial 999 or attend your local A&E. Depending on the urgency of your condition you may receive telephone advice from a Health Advisor or Clinician, be booked into a face to face appointment at a local treatment centre, or receive a home visit from one of our mobile clinicians. Alternatively, you may be directed to a more appropriate service for your needs such as a Minor Injury Unit, Walk-in Centre or local Pharmacy. When you are injured or unwell, choosing the right care, first time can save you time and effort, as well as helping to make sure you get the treatment you need as soon as possible. If you are unsure which service is most appropriate for you, call NHS111. How do I access the IUC Service? What happens once you contact NHS 111? 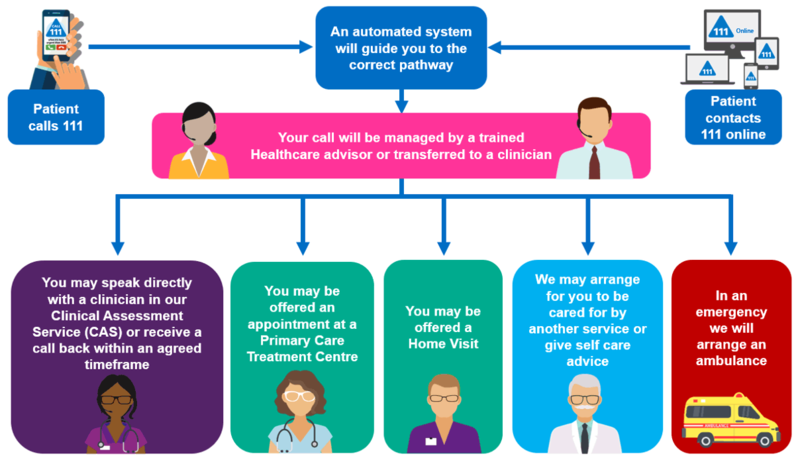 The diagram below shows a typical patient journey through the Integrated Urgent Care Service. New pathways have been set up to give faster access to a clinician for particularly vulnerable groups such as those who are under 2yrs and over 85yrs. We understand that no two patients are the same and we are keen to learn from the experiences and knowledge of a wide range of service users.